Dance has been used ritually for millennia. Stone-age rock paintings have been found depicting dance. The ancient Egyptians had dancers for festivals and ceremonies. Dance to tell stories, to express emotion, and to accompany ritual has figured in every culture, and every era. The rituals that took place at the great temple complex of Angkor in Cambodia were no exception. I was lucky enough to visit this World Heritage Site in 2010, where I spent day after day traipsing through big temples dramatically overgrown with trees, trailing after tour guides to catch snippets of info, and climbing to the temple tops to take in views of the flat landscape. You could visit for just a day – after all one temple can look much like another – but I was captivated by the scale and the beauty. Angkor Thom, only one of the main groups of buildings, covers 9 km². Almost every building is a temple, but my favourite is not – it’s the dancing school. Walking through the ruined building you can make out the floor plan. I imagined students running to practice rooms on time, trying on costumes, listening (or not listening) to their teachers – the same experience for students hundreds of years ago as today. 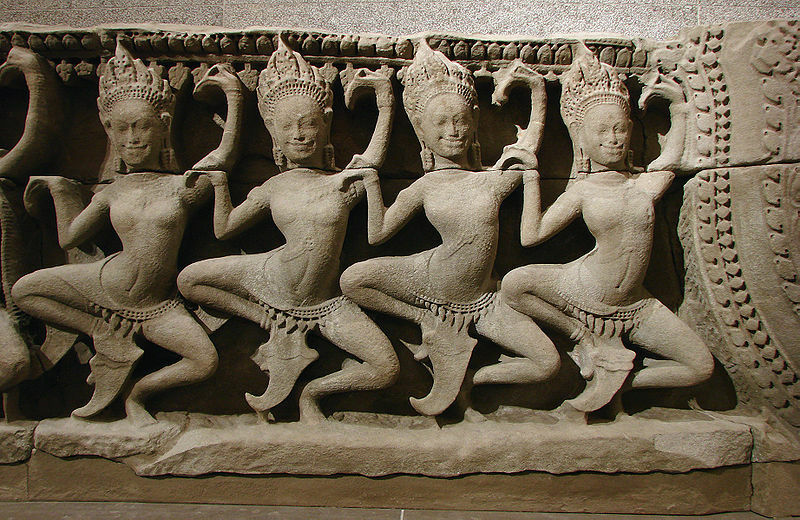 During the era of Angkor, dance was ritually performed at temples. The young dancing girls depicted Apsara, female spirits, as well as portraying stories from the Ramayana (an epic poem) and traditional stories, both during ceremonies and to entertain royalty. Apsara can be seen depicted on temples throughout Asia from India to Indonesia, but they are nowhere more prevalent than in Angkor. Around 800 AD the Khmer kings ruled over a wealthy empire across South-East Asia. They began work on big temple projects in the capital of Angkor that were added to by successive rulers. The complex spread further and further outwards as each tried to leave his mark. Each artist, too, filled up every bit of wall and pillar with carvings of elephants, battles, stories and apsara and devata. Over time Buddhism was adopted as the main religion, and the existing temples were repurposed instead of destroyed. In the 15th century Angkor was abandoned, after the fall of the empire. Cambodia fell under the control of Siam (modern day Thailand) and, later, France. The classical dance of Cambodia was sheltered and developed in the royal court during these years, and, post-independence, was formalised into a Royal Ballet by Queen Kossamak. They performed for public occasions and ceremonies, and were seen as iconic of Cambodian culture. Then came Pol Pot’s Communist regime, from 1975 to 1979. The damage committed by the Khmer Rouge decimated Cambodian life and culture. Many dancers were killed or starved to death. Those who survived were determined to resurrect Khmer classical dance and over time it regained lost ground. Today you can watch performances by both the Royal Ballet and by local groups dancing in Angkor again after so many years. At Angkor tourists stop and pose for the obligatory Apsara photo – arms out, elbows and wrists bent. These female spirits of the clouds and waters figure in Hindu and Buddhist mythology, often dancing in the palaces of the gods. The full-hipped, beautiful figures are depicted both standing and in dance poses. Standing still, they are considered devatas – guardian spirits – and posed they are considered Apsara. Thousands upon thousands of both adorn the walls and pillars of the temples. Most if not all of them are entirely unique. I took picture after picture on my visit, one of which is the profile picture for this blog. Five line a wall here, three encircle a pillar there, two pose together over there, their hands touching. They are all face-on, all barefoot and all wear elaborate adornments. Their arms, breasts, stomachs and often legs are uncovered. Their stance, headdresses, jewellery, and garments are all intricately and individually carved. This one arcs in a deep knee bend with one foot off the floor and one hand arced above her headdress, which is shaped like three coronets. That one has one hand in front of her, thumb and finger touching, and the other arm to the side, bent at the elbow. Two solid anklets encircle each ankle. On the next wall one wears heavy earrings that have stretched the lobes of her ears. Jewellery also adorns her waistband. Her headdress has a large studded sphere with a leaf shape emerging from it. And beside her are four grouped together, caught in action. Their skirts billow with movement. Despite their heavy adornments they look light and graceful. Half-smiles of enjoyment are on their faces. Cambodian classical dance can be called dance-drama as it is dance that is intended to convey a story or message. The movements share similarities with other Asian dance styles as they have all, over the centuries, influenced each other. The movements are slow, deliberate, close to the body. Posture is kept taut, back and feet arched, and the fingers flexed. The dancing is grounded, subtle, but with flowing quality. Certain hand and face gestures convey specific meanings, for example to represent flying. The Apsara Dance in particular aims to evoke the tension between earthly groundedness and heavenly lightness. The costume is a key element of the performance. Much like the apsara in Angkor the dancers wear exquisite headdresses, wrist, ankle and arm jewellery, and thick chains of rank, known as kse-sangvar. Less like the carvings, they are covered up, wearing bright costumes often crafted from silk. Previous attempts to foster dance in Cambodia, such as the Queen’s efforts in the 1940’s and the post-Khmer Rouge dancers, have focused on reviving and preserving classical dance. Contemporary dance is now being tentatively explored, with companies like Amrita forging new pathways for classical and contemporary dance in Cambodia that both reflects its centuries-long heritage and looks out into the future.